Here are ExploreTT's ratings and reviews. 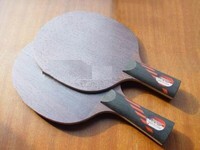 These ratings are useful because ExploreTT has his/her own standard and will rate and review the ping pong equipment accordingly, giving you accurate and useful ratings and reviews to aid you in your next online purchase. If you are an intermediate or even beginner player, this blade can do wonders for you :) It is good for everything you can think of. However, it is of great importance to beware what rubbers you put on. If you put on rubbers with soft or even medium sponge, it will come out slow, because the carbon layer is placed deep within the wood and it is harder to activate it. But to compensate that, this is a great opportunity for short games or away from the table when the carbon activates on harder strokes/punches. So if you manage to put the right rubbers on it, you are going places with it. Durability is great. Very good blade for me and I think it is worth a try for a lot of people. But to be honest I don't think that it is that good for intermidiate and advanced players. Update: After some time I realized that this blade lack some kick in speed and I have to put very fast and hard rubbers on it to play my offensive style of game effectively so I decided to move on to another blade. Also its quality is not that good in comparison to other blades. In my perspective this blade is not OFF or manufactured OFF+ rate but I think it's actually OFF-. And I've noticed in other Donic products that their rating system is not very accurate and they always make their products seem faster than they actually are (since they use terms like OFF++ which don't really exist). Nevertheless it's still a great blade. I'm disappointed that it's gonna be 2018 and there are still no reviews of this blade. A person would think that it is no good since there are no reviews of it... Well I'm here to tell you that it's a grave mistake if anyone thought this way. Coming with empowering design, good fit in the hand and cheap price, this could as well be the best blade for you. Off the bat you notice that it needs sanding on the edges and that on bounce it has a bit of hollow sound, but those details are neglectable in comparison to the quality of the blade that you get. You also notice that the blade has centered weight focus, so you can put heavy rubbers on it and still would feel easy and light to play with even though it's not the lightest. So use just a little sandpaper around the edges near the handle, forget the hollow sound, put some rubbers on and you are about to see how amazing the blade can be. Performance is ofcourse the best part of it. On the first few balls playing with it, your impression is that it's speed is the same as described by the manufacturer, but actually it is faster (just as I hoped it to be). When you start hitting harder and harder, the blade doesn't back down and support you with the power that you need. That is because of the carbon embedded. (That is the reason I put speed rating as 9 and not 8 like manufactured stats). But despite the carbon, the blade still keeps a woody feel, and this is the part that I love most! Its control is like a breath of fresh air for me. And the flexibility is just right - not too soft and not too hard. Playing for some time with it, my technique immediately improved, healing "scars" left from past experiences. I am now doing shots with it that I never even hoped to do with previous blades. For lower level players I would recommend slower rubbers, where higher level to pro would be satisfied with fast rubbers. As for me, this IS the best blade I've ever had and probably played with. I do not plan to change it for a long time. If you are a beginner, buy this blade right now. The handle is very comfortable and eye-candy. Despite all the sweat from playing with it, even now the handle doesn't seem a bit different from when I first bought it. The technology that they used for this blade is something amazing, and I really like it. With this blade you can do everything. Balance between speed spin and control is good. Especially when it comes to spin, this blade has no equal. I put Tenergy05 on this bad boy and beleive me I've never generated more spin. But be careful what rubbers you put on. It is suitable with hard and very fast sponges (max thickness). Not suitable for tenergy. This blade is made for tensor rubbers. If you don't know what tensor rubbers are, well, it means that they are stretched from the get-go. A good chunk of european rubbers are made with this technology. I tried Donic Bluefire M1 on this blade (Formula Donic = tensor) and Joola Rhyzm and I'm 100% satisfied. However. If you're an intermediate or greater offensive player, you definitely would want something more solid and fast. After I improved my skill with this blade, I realised that I need something that would do more justice away from the table, so i'm switching it. Also gotta be carefull with the blade because the durability is poor, after some time my blade has a lot of damages to it despite my carefullness. I will miss this blade though. 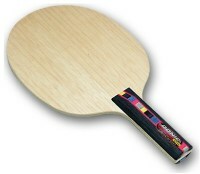 This is one of the blades that makes you really enjoy table tennis. Not a good blade for me. Handle is uncomfortable and small for my hand. I was looking for something fast, but it turned out that this is way too fast. Control is... Bad. If you intend to play with this blade, go with soft, slow rubbers, please... When it comes to durability, well, I accidentaly hit it on the floor and it shattered... I bought it from the local store. After that I started searching for products that are sold either online or from official distributor. And not this trademark. Beleive me there are way better trademarks than Tibhar. (Updated) For offensive skilled players. NOT for beginners though. It took a lot of time to get used to for me personally. But after that - no problem. Good for attack-oriented players, but not so much spin oriented, rather than flat hit. But maybe with the correct rubber it can do even more stuff. 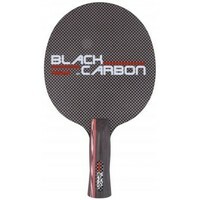 Comfortable handle, light weight, good feel, lot of sweet spot, nice look. If it comes to you as too fast, then I suggest to change the blade, because slow rubbers don't work too well on the blade... Or you can work on your technique and feel for the blade. I play with it for 1 year but now I feel like I need to move on.